Heritage Walk: Looe. As part of the Heritage Open Days, Looe’s museum will be open free of charge plus there will be a chance to visit the towns Council Chamber in the Guildhall where there will be a display of the hidden treasures of the town. At 10.30am and 2.30pm there will be a guided walk with Looe historian Mark Camp from the museum looking at the history of the town. Heritage Walk: Saltash. 1pm Follow the newly created Blue Plaque Walk around the town with local historians. It is hoped that visits to the museum, Mary Newman’s cottage and Eliot’s Store will be included. Talland SWCP Circular: Start Talland Bay car park 11am. Kernow Walkers, the younger branch of the Ramblers, will be walking from Talland Bay to Looe and back via Kilminorth Woods in the West Looe Valley. Go along and see if you like it and maybe join? Walk lasts three hours, seven miles in length. Woods Watch Walk: Kilminorth Woods, Looe. Join the Friends of Kilminorth Woods on a morning walk through ancient woodland alongside the West Looe River. This walk will also include a litter pick to tidy up the woods. Tamar Riverside Walk: Mutton Cove car park, Plymouth 10.30am. 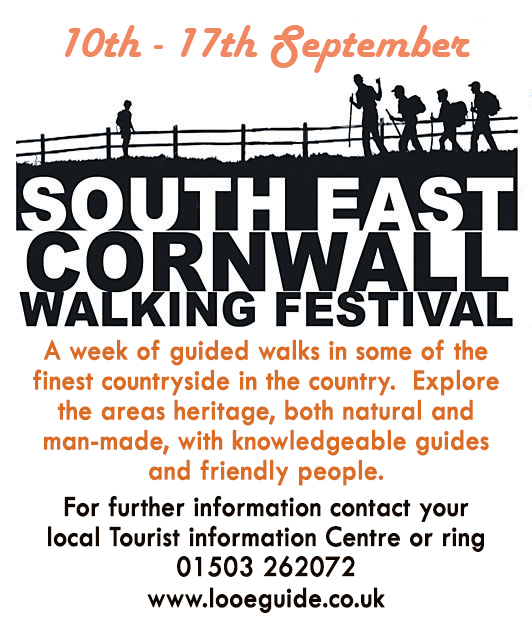 For the first time ever the walking festival crosses out of Cornwall and into Devon, but only so we get a view of Cornwall!. Join the Saltash Walk & Talk group for a strole along the historic waterfront around the Royal William Yard and Devil’s Point. Ethy Woods Walk: Lerryn. 10.30am. Join festival organiser Mark Camp for a walk through riverside woods to the Fowey River, then onto St Winnow and it’s farm museum before walking back through the fields. Five miles, three hours approx. Siblyback Circle; 10.30am A gentle walk around the moorland reservoir near Liskeard. Walk is organised by the Tamar Valley Walk & Talk group so come along and make some new friends, discover somewhere new or just enjoy the cake at the cafe at the end! Minions Meander: Heritage Centre car park, Minions 10am. Brian Oldham of Walkers are Welcome returns this year to lead a six mile circular walk. Passing through disused mines, railways and quarries, hamlets and a cheese factory before ending at the Hurlers where you will be able to see how the archaeologists are processing in their search for a 4th stone circle. Sorry No dogs on this walk. Looe Island History Walk (Sadly this walk is already fully booked. Hingston Down Walk: Tamar Valley Centre, Drakewalls, Gunnislake 10:10am, This Beyond Walking for Health walk follows public footpaths up to Hingston Down with stunning views from the heathland across to Plymouth Sound. The return journey will end just in time for lunch at The Rifle Volunteer Inn, St Ann’s Chapel. Two-hour walk, 3 miles. Liskeard Looe Walk: Liskeard Station (Looe platform) 9.50am A welcome return this year to the Liskeard to Looe Walk, Yes it’s 11 miles, but it’s a lovely walk and there’s only one hill…. Start at Liskeard Train Station and return by train or bus from Looe. Bring a packed lunch. Walk usually takes about seven hours. Duloe Beer & Cider Festival Walk: Sandplace Station 10.45am. A shortish walk to work up a thirst before the traditional walking festival visit to the Beer and Cider Festival at Duloe. Lanteglos to Lansallos Walk: Frogmore NT car park, nr Lansallos 11am Five mile walk around Pencarrow Head and Lansallos with the Ramblers. The nation’s biggest walking group organise 100s of walks every week. 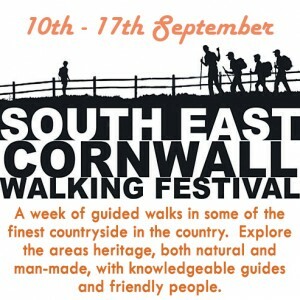 Come along and join them for this short’ish walk on a wonderful piece of the Cornish coast and see how they do it! Dogs welcome. Bring boots, food and drink. Bring cash for car park if not a National Trust member.